SAIS Consulting Club is a career organization at the Johns Hopkins School of Advanced International Studies (SAIS). The group provides career advice, training, and networking opportunities for students interested in various consulting fields including management, development, and political risk consulting practices. On Monday October 26, the SAIS Consulting Club hosted an internship career panel with five SAIS students discussing their experiences with consulting internships. The panelists came from McKinsey, Deloitte, Avascent, and the Kaizen Company. The panelists discussed their interview experiences, project work, and tips for a successful application. The panelists also answered questions on case prep, work-life balance, and building resumes. On Friday, October 7th , 2016, the SAIS Consulting Club and Mckinsey & Company co-hosted the SAIS-McKinsey happy hour at the Madhatter bar. It was a great opportunity for current students interested in the consulting field to connect with SAIS alumni and current McKinsey Consultants, Dylan McCall-Landy and Allan Breed. With some excellent quesadillas and nachos, many SAISers enjoyed communicating with alumni about their experience in Mckinsey and valuable suggestions for career plan. They shared views on how to prepare for case interveiw, ways to networking and the lifestyle of consultants. Moreover, Allan also shared his beloved memories of his times at SAIS. It was an impressive showing- more than 20 SAISers in all. It goes without saying that the SAIS-McKinsey happy hour was a great success. So, thank you fellow SAISers for taking initiative and attending the event. And, a very special thank you to SAIS alums, Dylan and Allan, for taking time out of your busy schedules to meet with the SAIS Consulting Club. On Wednesday, September 21st, SAIS Career Services and the SAIS Consulting Club had the pleasure of hosting Avascent for an employer information session. Avascent is a boutique consulting firm serving Fortune 500 and private equity firms in the aerospace, defense, and technology sectors. Avascent specializes in advising clients on strategic growth, international expansion, M&A transactions, and capture support. Avascent is home to nearly 20 SAIS alumni. Students were pleased to learn that Avascent is looking to recruit Summer Analysts and Full-Time Analysts from SAIS. The skills they seek are: primary and secondary research, quantitative and qualitative analysis, and professional presentation skills. Avascent emphasized the importance of the case interview and urged students to practice, practice, practice. Avascent is recruiting for several Summer Analyst and full-time Analyst positions starting the summer/fall of 2017. Avascent is a boutique consulting firm serving Fortune 500 and private equity firms in the aerospace, defense, and technology sectors. Avascent specializes in advising clients on strategic growth, international expansion, M&A transactions, and capture support. Applications for internships and full-time positions are currently up on SAISWorks and due by October 9. Additionally, Avascent will be hosting an information session this Wednesday, September 21 at 12:30pm. Contact Daniel Flesch (Strategic Studies, ’15) at dflesch@avascent.com for more information. On Friday, April 1st, the Consulting Club led a team of students up to New York City to visit four consulting firms: Control Risks, PwC, A.T. Kearney and Eurasia Group. 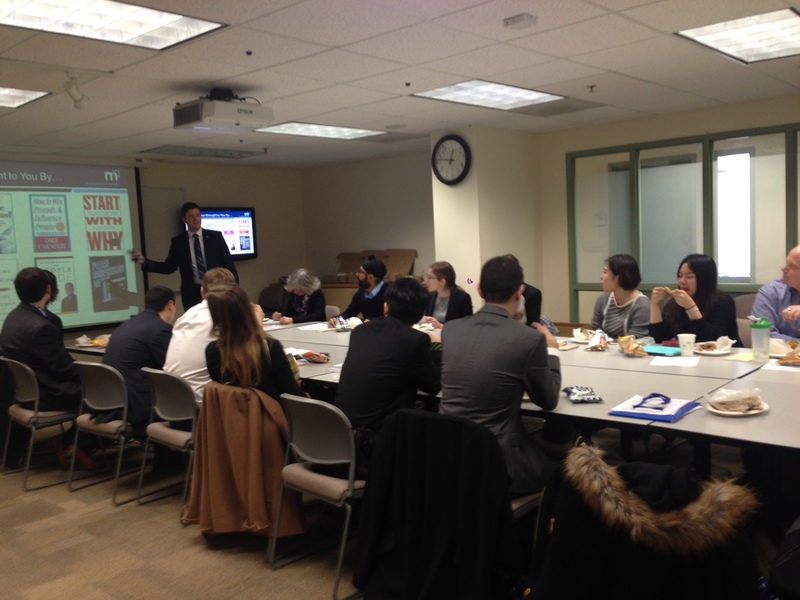 Led by club vice-presidents Grant Zappulla and Sibo Liu and joined by Career Services Associate Director Colleen McCusker, the group met with SAIS alumni and other employees from these firms at their New York offices. The day started with a visit to Control Risks, where they learned about the company’s practices and focus on integrity, political and security risks with their clients. Next, the team proceeded to PwC where employees, including representatives from the firm’s Corporate Intelligence group discussed their work activity and backgrounds. After lunch near Times Square, A.T. Kearney was the trek’s host for their third stop. There, the group learned about career paths, day-to-day activities and opportunities from two of the firm’s consultants. The day concluded with a session at Eurasia Group, where three of the company’s consultants discussed sample projects they had worked on recently and the collaboration between their consulting and research teams. 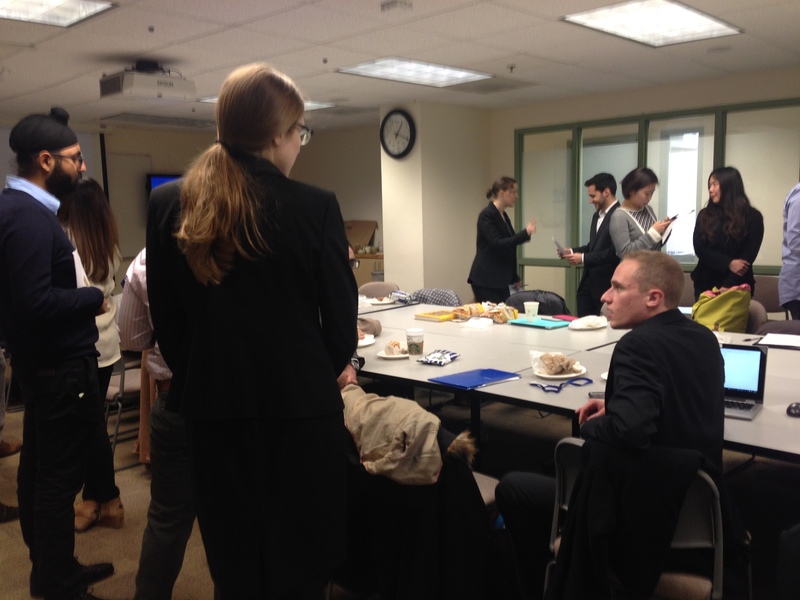 On Friday March 4th, the SAIS Consulting Club and Career Services welcomed consultants from government consulting firm M Powered Strategies on campus to discuss the firm’s mission and to hold a round-robin resume workshop. Student attendees received personal feedback on their resumes and had their questions answered about both the government consulting industry and M Powered Strategies in particular. This fall semester the Consulting Club hosted an internship panel to share the different experiences that the consulting world has to offer. Lorena Valente spoke about her experiences at the Albright Stonebridge Group and McLarty Associates; Edward Moe spoke about FSG, John Lu spoke about Deloitte, and Amy Fisher spoke about The Kaizen Company. Each panelist represented a different sector of consulting and shared their personal insights about their experiences. Throughout the course of the hour-long panel, each student thoughtfully answered their peers’ questions about their responsibilities and assignments and shared some sage advice for our first-year attendees, on everything from how to connect with your interviewer to what type of firm might be best for their needs. Both the speakers and attendees left with a better understanding of the different forms firms can take under the classification of “consulting,” in addition to a practical knowledge of what consulting means in life after SAIS. Every Fall, the SAIS Consulting Club invites a select group of students to visit three consulting firms throughout the DC area. Each visit, which lasts about two hours, offers students the opportunity to meet with several industry professionals, gain a first-hand understanding of a career with that firm, and ask off-the-record questions specific to the student’s interest. By visiting firms of different sizes and different industries, students are introduced to a wide range of networks and professional paths. Before the day-long trek, students are required to participate in a pre-trek meeting, where Consulting Club Board Members cover day-of logistics, proper attire, and other pertinent information. Students are also required to complete additional reporting on a select firm. For the first time, Control Risks and PricewaterhouseCoopers’ Advisory practice, hosted the Consulting Club. 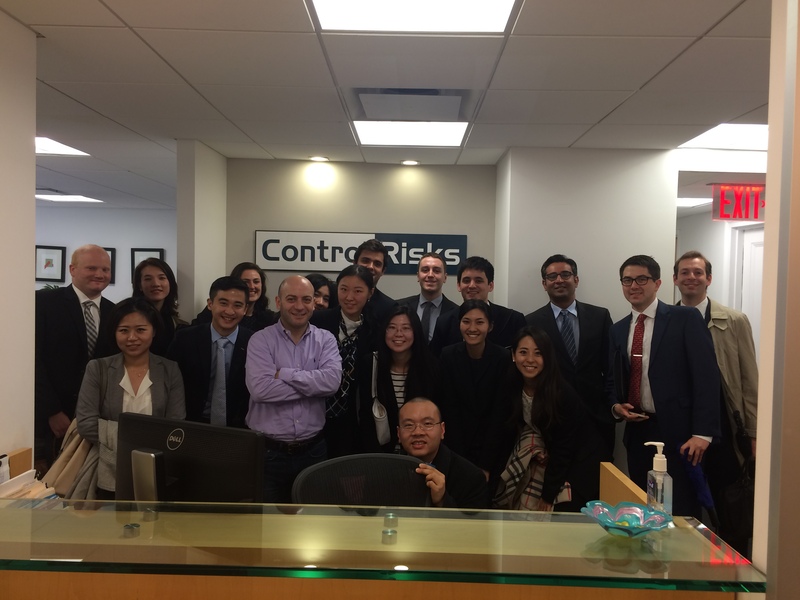 At our first visit, Control Risks, a global risk consultancy located near the White House, gave a wonderful introduction students to the firm’s dynamic, collaborative culture. A diverse group of six team members – from marketing to crisis management – met with us to speak about their projects and professional path to Control Risks. They emphasized that SAIS students are great because of their diverse backgrounds, research skills, and experience working overseas. Skills required to do well in this job include the ability to write a properly targeting piece clearly and concisely. After lunch, students visited PwC to meet with their rapidly expanding Advisory Practice. Following a fantastic introduction to consulting at PwC, three consultants from different areas of expertise (public sector, global public health, and forensics) gave an in-depth review of their projects and clients. Students were surprised by the work performed across their competencies (from the UN HeforShe, to the Lean In Movement, to private equity and global growth markets). The visit highlighted PwC’s friendly, learning-oriented culture, including its “five dimensions” of professional development. For the third and final visit of the day, 10 additional students joined the group for a visit to the Dalberg Group. Always a student favorite, we met with members from two of the Group’s arms: Dalberg Global Development Advisors (the consulting arm) and D. Capital Partners (the investing arm). Two consultants gave examples of projects under Dalberg’s practice area and their methodology for addressing a client’s needs. A member from D. Capital discussed their investment advisory services and innovating financing mechanisms. Consultants are usually hired from their interns. It goes without saying that these visits are made possible because of a close network of fantastic SAIS alums. The Consulting Club is incredibly grateful to those that have offered their time to coordinate, schedule and host current SAISers. To get hired at PwC they look for individuals to fit specific skills on a team – having certifications specific to the desired job and knowing that specific line of service well (in the context of the firm) is highly regarded. Dalberg underscored that as a consultant, your job is not be an expert necessarily, but rather to be analytical: be smart and adaptable; present ideas in a clear, concise manner; and bring fresh insight. To be successful – regardless of the arm or position – one must have an entrepreneurial spirit. Dalberg, in particular, looks for individuals that want to contribute to and learn from others. On Friday, October 23, 2015, the SAIS Consulting Club and Mckinsey & Company co-hosted the very first SAIS-McKinsey happy hour at the bar, Mission Dupont. It was a great opportunity for current students interested in the consulting field to connect with SAIS alumni and current McKinsey Consultants, Sara O’Rourke and Allan Breed. With an inviting happy hour menu, coupled with some excellent quesadillas and nachos, many a SAISer enjoyed listening to Sara and Allan speak about their experiences prior to and in their careers with McKinsey. For those of us unable to attend, Sara and Allan shared their views on how to land the interview, ways to strengthen a resume and the lifestyle of consultants. Equally important, Sara and Allan also shared their beloved memories of their times at SAIS. It was an impressive showing- more than 40 SAISers in all. It goes without saying that the SAIS-McKinsey happy hour was a great success. So, thank you fellow SAISers for taking initiative and attending the event. And, a very special thank you to SAIS alums, Sara and Allan, for taking time out of your busy schedules to meet with the SAIS Consulting Club. In early October a handful of SAIS students had the unique opportunity to meet with SAIS alumni Amy Watve, the Strategic Initiatives Director at The Kaizen Company, a small international development consulting firm here in Washington DC. Over coffee Amy shared her personal and The Kaizen Company’s background, gave an overview of the international development consulting industry, and offered career advice to the students. After receiving her MA in international relations and strategic studies from SAIS, Amy went to work for McKinsey & Company where she “got paid to do an MBA.” After several years at McKinsey, she decided to move to a smaller firm where she would not only be advising, but take an important leadership role, making decisions and overseeing the growth of the firm. In her role at Kaizen, Ms. Watve oversees new business development. At this stage in the firm’s development, Kaizen mostly competes for federal business opportunities, both with other similar firms and with the larger, more established development companies like Chemonics and Development Alternatives Incorporated (DAI). Although the majority of Kaizen’s projects come from the United States Agency for International Development (USAID), they are planning to develop their private sector business and enhance their innovation incubator in the coming years. Amy noted that the international development industry is by and large driven by USAID and its counterparts in the UK and Australia. Firms like Kaizen respond to requests for proposals from governments for projects that last typically 2-5 years. Kaizen works with USAID and other stakeholders to develop a plan of action to improve the organizational capacity of a specific enterprise, and then works with their in-country teams around the world to implement the project. Whether accelerating sustainable agriculture in Afghanistan, training private sector professionals in Egypt, or cultivating start-up entrepreneurship in Israel and the West Bank, the firm focuses on delivering long-term sustainable results. Throughout the discussion, Amy shared insightful advice for students wishing to pursue a career in international development or management consulting. Take as many Gordon Bodnar classes as you can, she said. The understanding of financial processes and organizational structures that she took away from his classes equipped her with important skills for the world of consulting. There are multiple routes for getting into international development consulting, many of the small firms don’t have the capacity to train fresh graduates so often hire from the major management consulting firms. Working with government organizations or NGOs in the industry are other avenues into the field. International development consulting is an exciting field for SAIS graduates, it combines the SAIS knowledge base of economics and international relations with policy and strategy in a multicultural and dynamic environment. Thank you to Chris Gragg for the recap!